I kept going. It was LOUD! We parked the van and seemed like the front was listing to one side. I got out anxiously. There, before me, was a tire rim without a tire to be found…anywhere! The proceeding phone call to my Dad from my Grandparents’ house (this was pre cell-phone era) was terrifying. He met me at Grandma’s to tell me he found the tire in a ditch a mile and a half down the road. The groove the rim made in the road haunted me for years after that every time I made the journey to that part of town. I was embarrassed, but then my friends learned of my tireless adventure and the teasing turned my embarrassment in to mortification. Thankfully I can laugh at the situation today, but now that I work in the auto repair industry, this incident formed my desire to help young drivers avoid some of these completely avoidable mistakes. Here’s a few lessons that can help new drivers, and their concerned parents, as they gain maturity in the drivers seat. The person in the driver’s seat is the boss and no one else. Trust your knowledge of driving, the feel of the vehicle, and your inner gut; but don’t get over confident. It’s easy to get annoyed by the phrase, “It’s better to be safe than sorry,” but when driving nothing could be more true. I’m very lucky my friend and I didn’t get into an accident because of our neglect. There are enough thoughtless bad drivers on the road to look out for, so it’s not worth being the cause of an accident. Whether it’s showing off for your friends, or not sticking by your own convictions, be the driver you want those driving around you to be. I know how difficult it can be for a teenager to both fit in and do the right thing, but when the lives of you and your friends are on the line, it’s better to be alive and called a “Granny Driver” than be dead but remembered as “Cool”. If this is difficult advice to follow, limit the number of people your car to only your most trusted friends until you reach a point when you can be confident and in charge no matter what anyone else thinks. Life and limb are not worth fitting in with the crowd. Also, if those you are riding around with aren’t following these same principles, don’t ride with them. Knowing the various noises and vibrations your vehicle makes and physical traits it has when it is in good running order can save everyone money down the road. Your typical new driver either shares a family car or has an older used car and doesn’t have a lot of dispensable income for repairs. The first 6-8 years of your driving life is typically focused on paying for and succeeding in school, not expenses like car repairs. Being able to detect a slight change and getting it checked out immediately (like my family’s vans tires) can stop a problem from developing or getting worse, thereby preventing a larger repair bill. When your teenager has her driver’s permit, let her practice in the car she’ll be driving with her license if possible. Point out to him the different noises, vibrations, and quirks that particular car has as he’s driving with you. 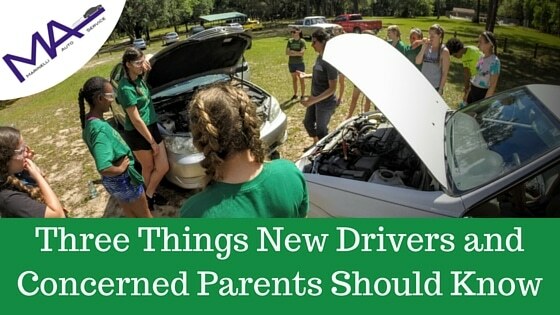 Helping your student become familiar with the vehicle before she goes out on her own in it so that if something changes or a new sound begins, she can tell you about it. Also, new drivers should learn how to check their tires and oil, and do it monthly, from the very beginning. Every driver should do this monthly, so making it a habit from the start is part of the learning process and responsibility. Other good skills for him to know is changing a tire and jump starting the battery. It’s no fun to be stuck, especially when it’s your child and Mom and Dad aren’t there to show her what to do. “What kind of car should my teenagers drive? Is leasing a good option?,” are questions we’ve gotten from a few parents whose kids were about to get their licenses and won’t be sharing one of the parent’s vehicles. We recommend new drivers start out in a reliable used vehicle. Driving off of a new car dealer’s lot in a shiny new vehicle can feel really good…until you are in the parking lot after school to find the kid parked next you scratched your car with her door. Or, you were heading to track practice with your friends and you misjudged your stopping distance, so now you have a dent in the bumper. With a new car, you care about those types of things, so you end up paying to get them fixed. With an older car, it’s disappointing, but you just live and learn. You can find a used vehicle every bit as reliable as a new one if you go about it in the right way and make an informed purchase. Work with your mechanic to figure out what make and model would be a good fit for your family and then have him inspect it before money changes hands. You can navigate this process by following our Guide to Buying A Used Car. Remember that safe and reliable is better than having an impressive image – something that can be a challenge for teenagers but is a great life lesson. Driving is a necessity in many parts of the world, but it’s also a great privilege and a huge responsibility. Families should be on the same page when one of its members starts driving. HealthyChildren.org has a great teen driving agreement worksheet that can help you have that conversation.